December 2014 marks the 50th anniversary of the Christmas Flood of 1964, which caused $157 million in damage ($1.1 billion in today's dollars), and as a result, 17 Oregonians lost their lives. No one knows when the next major flood event will occur. 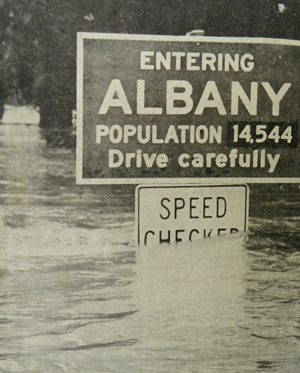 The City of Albany encourages you to be flood-ready. 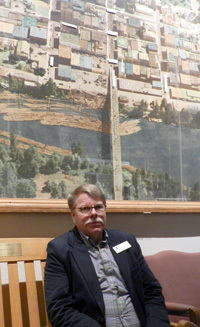 County records dating back to the mid-1800s indicate that the Willamette River has caused significant flooding to the County at least seven times. The record flood of 1861 had almost three times the volume of water in the Willamette River as measured at the Albany gauge. The 1964 flood would have rivaled the 1861 flood without the flood-control dams. While the 1964 event was the most devastating of its kind in recent times, our region has experienced similar flooding emergencies over the past few decades. The Willamette Flood of 1996 illustrates how Albany and surrounding areas remain at continual risk. The rain and flooding started Dec. 18th and stuck around for a couple weeks, until Jan. 7 of 1965. It was a rainstorm that affected the whole Pacific Northwest. But where I grew up, we had a farm and our home was on an access road that went down through a low area that was a drainage area for a lot of fields and rivers in South Albany and that was our access road to our farm as well as our home. Today that road is called 53rd Street. At that time it was called the dump road; everybody called it the city dump road because it was the access road with an easement to allow the City to access the city dump. Our house was at the end of a gravel road and it was prone to flooding, regardless of the 1964 flood, especially if it was a rainy season. The road was the issue because it was our only exit from the property. When the flooding occurred in 1964 we were at our home. We had one neighbor at the time that my folks sold property to. So we could not leave our house, and as a 14 year old kid in school at Calapooia Junior High, I was really ticked off because it flooded beginning the first day of Christmas vacation so we were stranded during my whole Christmas vacation. The flood couldn’t have started while we were in school, but no, it was during my Christmas vacation. Being a farm situation, our family had a good supply with a freezer full of meat and just canned vegetables from that season so we were pretty well off being able to survive during that time. How do get to the grocery store? Fortunately, we still had electricity and the phone to communicate. We were somewhat isolated because of the flood waters. We could see it on the news. What do you do for two weeks? We had farm animals to take care of to make sure they were safe from the flood waters like sheep and feeding cattle, which kept us busy. We got to know our neighbors better at that time. Lots of card games; played a lot of pinochle. We were still able to have Christmas. We got cabin fever after a time. Our house was located right next to a lake and the lake came up to within 20 feet of the house. The only time I’ve seen as much water is in the time of the flood of 1996. And a similar thing happened and I was just visiting my parents, and my brother was able to shuttle people in and out because his car was high enough. But even then it got difficult. So I had to gather my stuff and get the heck out of there. It kind of brought back memories of the 1964 flood.